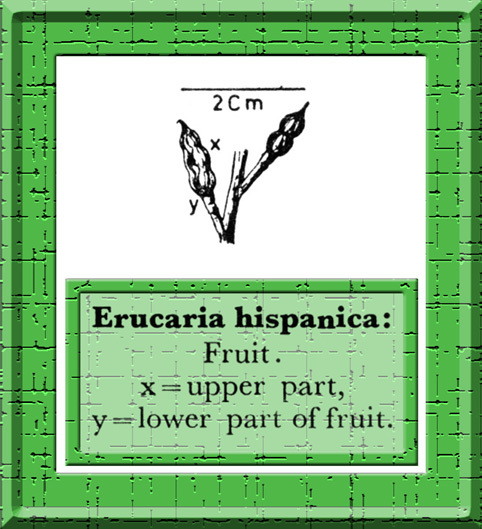 Erucaria hispanica (Linn.) Druce in Rep.Bot.Exch.Club.Brit.Isles. 3:418. 1914. Burtt & Lewis in Kew Bull,288.1949; Hedge in Davis, l.c.274; in Rech.f., l.c. 49. Annual or biennial, up to 80 cm tall, branched from below, glabrous or sparsely hispid below with simple hairs. Leaves bipinnatisect with very narrow lobes, petiolate, ± fleshy ; basal subrosulate, 10-18 cm long, 3-5.5 cm broad; middle and upper leaves much smaller; lateral lobes 3-5, alternate, narrowly linear, 1-4 mm broad, those of uppermost leaves often filiform, sparsely lobulate or irregu¬larly dentate. Racemes 30-45-flowered, lax, increasing up to 40 cm in fruit, ebracteate. Flowers about 1 cm across, mauve; pedicel 1-2 mm long, hardly increasing in fruit, thickened, appressed. Sepals 5-7 mm long, 1.2 mm broad. Petals 11-13 mm long, 4-5 mm borad, obovate, clawed. Stamens 7-9: 8-10 mm long; anthers about 1.5 mm long. Siliquae (7-) 10-15 (-17) mm long, biarticulated, torulose, erect or slightly curved; lower cylindrical part 4-6 mm long, 1-1.5 mm broad, usually 4-6 seeded, with coriaceous valves; upper part about as long as the lower part, but 1.5-3 mm borad, compressed with 3-5-veined valves, 1-3-seeded, breaking away as an unit; beak 2-4 mm long, narrow style-like; seeds ellipsoid or suborbicular, about 1 mm long. Distribution: S. Europe, N. Africa, Arabia, Anatolia, Syria, Iraq, Iran and W. Pakistan. A rare species in our area and perhaps introduced from Iran. Burtt & Lewis (l.c.) recognized it as widespread species from the Mediterranean to W. Pakistan, showing a geographical cline from East to West in respect of the length of the cotyledons.